Chef Michelle has an eclectic lifestyle from being a loving wife, a nurturing mother, superstar entrepreneur and Chef. How does she do it? With the love and support from her friends, family and super awesome team. Before entering the culinary world, Chef Michelle worked eight years for Ferguson Enterprises as a showroom consultant. Pitching the idea of a need for corporate chef to her management team quickly landed her in culinary school. After receiving a Degree in the Culinary Arts at the Art Institute of Houston, she became the Corporate Chef for Ferguson Enterprises. 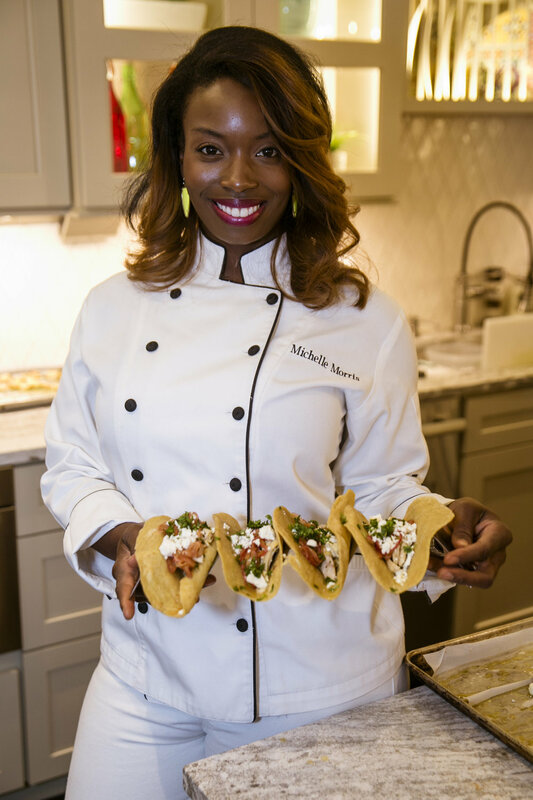 Chef Michelle’s passion for entertaining small and intimate groups led her to start a boutique catering company serving a niche in the culinary industry. Michelle’s sass, confidence and her thirst to grow allows her to create a vision to lead her team to success. Michelle and her husband, Darrell, recently purchased Well Done Cooking Classes at the end of September 2018. Well Done Cooking Classeses currently has over 80+ classes for all to enjoy.